Wanderful error Belgian 10 cent 1999 struck on wriong palnket and trugh cloth. Image found on numismativy.boutique.free.fr/catalog/product_info.php?cPath=2_22&products_id=93. 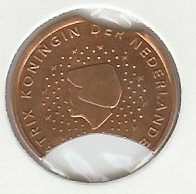 At the moment (march 2013) the coin is for sale at the price of 619 euro.